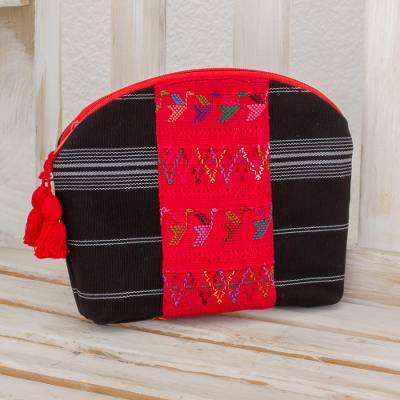 Handwoven Cotton Cosmetic Bag in Black from Guatemala, "Tactic Stripes in Black"
The artisan women of Tactic, Guatemala hand-weave this cosmetic bag of cotton on the traditional backstrap loom. Mirian Otzin presents the bag, featuring stripes of pearl grey over a body of black. Multicolored geometric patterns that depict a procession of birds accentuate a poppy red band at the center. It opens with a zipper to reveal a cotton and plastic lining, perfect for holding all of your beauty needs. You can find cotton cosmetic bag 'Tactic Stripes in Black' by Mirian Otzin in handbags categories such as Animal Themed Handbags, Geometric Handbags, Hand Woven Handbags, Cotton Handbags and Cosmetic Bags Handbags. Enjoy exploring these sections for other Novica treasures. Mirian embodies our Women’s Empowerment badge for the strength she has shown in the face of atrocity. "I suffered a terrible incident of sexual abuse, but I survived and have moved past it," she confides. Mirian continues to inspire us with her resilience. "When I was still a young girl, I learned the art of hand-weaving from my mother. I'm proud of preserving this ancient tradition and I'm passing it on to my children." "I love this art because it represents my past and my present. Through our weavings, we communicate our cultural values. Preserving this beautiful artistic tradition has become a challenge since young women don't seem to be interested in weaving, so we need to promote it or else it will die out." Mirian first learned how to weave from her mother, and wishes to inspire others and pass this tradition down to new generations." Mirian is a strong and amazing women who has managed to overcome a horrible incident of sexual abuse. Her hard work and determination have made her the inspirational woman she is today. Mirian has worked hard to create new designs which has led to the increase in her sales. Her perseverance and passion have helped her continuously expand and grow her weaving workshop. Mirian Otzin has received 2 microcredit loans with 0% interest from Kiva and Novica, the first for $200 and the most recent for $200. Both of her children are still in school and Mirian plans to continue to financially support their education. Mirian has two children that she supports, Julio and Ferando. Mirian gives work to both women and men in her workshop.